NGD Ugly old Lester Paulster! Discussion in 'Guitars in General' started by Jonny Hotnuts, Apr 22, 2016. Pick up this old gal today. She has been there and back but is a real peach. Complete with 'goof rings' and mostly original (repop tuners and strap buttons). hendrik7, Bob Pollock, stratman89 and 33 others like this. Well, that's f'n awesome! Been played, just the way it should be. So many closet queens around these parts. I have a mid 70s deluxe myself that I love. Last, shane8 and Starshine like this. A face that only a real player could love! She is awesome. I love beat up 70s goldtops. So underrated and the can sound and play wonderfully. back when I was in high school ('70s, graduated in '76), one of the frequent bands to play there (Fox, out of Berlin NH if I recall correctly) had a wine red deluxe with the mini buckers like that. I think it had goof rings, too. I remember staring at that guitar a lot, trying to figure out what the deal with the pickups was. The guy was a real good player and the band was pretty tight as well. Wonder what they are now? I was playing a 5 week, 6 night a week gig back in 1985 or so when one of the steady waitresses offered to show me her boyfriends gtr. Turns out he really wasn't much of a player but she knew it was a Gibson of some kind. So she shows up one night with that same gtr but I don't think it had the goof rings. It was glorious. Played great. Loved the mini hums and a nice medium weight. Originally I planned on playing it for a few songs and going back to my Strat but I played it all night. Im pretty sure he would have sold it to me but like a jerk I didn't even offer to buy it...have never found another gold top Deluxe since. I have a 2011 gold top deluxe, but that one is so much cooler. My '71 Les Paul Standard "58" without boo boo rings. These were Norlin's re-issue of 1954 LP's. About 1100 were made from 1971 to 1975. Most were gold tops, some cherry burst and very rare tobacco burst. gkoelling, shane8, fossilfuel and 4 others like this. My first les paul was a 74 deluxe cherry sunburst. Beat up too. Never shoulda sold it. Man, I can't wait til my Gibson guitars have earned their scars like that! I would be curious to see what the pickup routs look like without the goof rings in place. From what I understand, the goof rings covered "tooling marks" from routing mistakes. Or the extra rings make the pickup appear larger like a full size humbucker. What a sweet, sweet guitar. Awesome! Gibson used LP's routed for full size humbuckers, and since they are a bit wider than a P-90 (which is the same size as the ring around the mini-humbucker), the "goof rings" cover the tiny gaps. gkoelling and shane8 like this. I thought you said it was ugly? She's a beaut! Phnurt and morgan918 like this. And I've heard that some were because of the first reason, and some were because of the second reason. OP has to take them off and get us some pics! Wouldn't solve it 100%, given the "some." And for the first, maybe they were having a smaller number of incidents of flaws, but just went to putting them on all so they'd be consistent. I've read more than one person say they've seen multiples with them off and hadn't seen any flaws. The odd thing about the full humbucker size rout explanation, not that it makes it impossible, is why would they use mounting rings for a P90 rout, and then use another ring so that could go in a humbucker rout? Why not just use one set of rings that fit the mini to the full size? 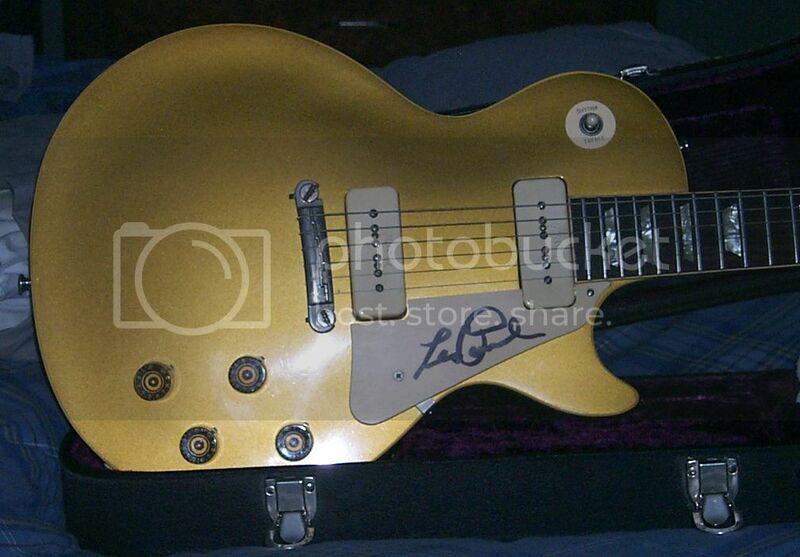 Honestly, no other guitar looks better to me than a worn Goldtop Deluxe LP! Please just adopt me already! Da Geezer, shane8 and Jim S like this.